Army Public School (APS), Kapurthala has recently given notification of 07 TGTs, PRTs, Aayah (Female) and Contractor/ Vendor Vacancies. The interested candidates can send your application form for the Army Public School Kapurthala Recruitment 2019 on or before 10.04.2019. APS Kapurthala Recruitment 2019-20 notification is out. As per the Notification, there are 07 TGTs, PRTs, Aayah (Female) and Contractor/ Vendor Vacancies. The eligibility is the 10th, Graduation and Postgraduation degree with B.Ed. The maximum age limit is 50 years. If you are looking for Jobs in Kapurthala Army Public School then this article is going to be very helpful for you. TGT and PRTs: Post-graduate/ Graduation with B.Ed. in the relevant subject with minimum 50% marks in both. Contractor/ Aayah: Invites sealed tender for running of the stationary and wet canteen in school premises. The age limit is 40 years and the maximum age limit is 50 years (for ESM). The age relaxation is available as per the department rules. As per the department rules. Test for computer, writing and teaching skills will be followed by an interview. Demand Draft of Rs. 100/- only in the favor of Principal, Army Public School, Kapurthala. You can send your application form along with all attested certificates to the APS, Kapurthala by hand or by registered post along with the Demand Draft of the application fees on or before 10.04.2019. You can check the APS Kapurthala Result or Interview List through the official website. Last Date: 10 April 2019. 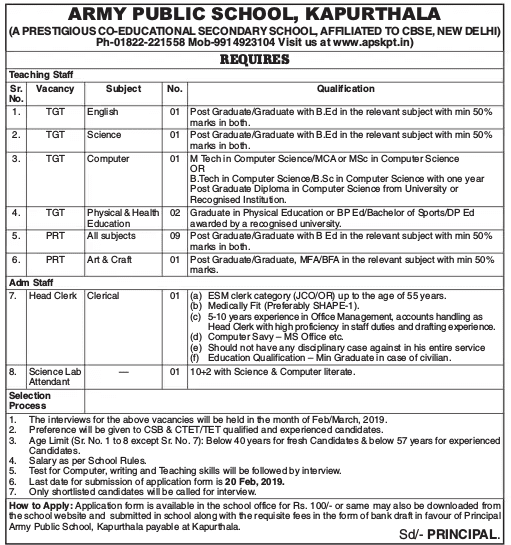 Army Public School (APS), Kapurthala has recently given notification of 17 TGTs, PRTs, Head Clerk and Science Lab Attendant Vacancies. The interested candidates can send your application form for the Army Public School Kapurthala Recruitment 2019 on or before 20.02.2019. APS Kapurthala Recruitment 2019-20 notification is out. As per the Notification, there are 17 TGTs, PRTs, Head Clerk and Science Lab Attendant Vacancies. The eligibility is the 10+2, Graduation and Postgraduation degree with B.Ed. The maximum age limit is 57 years. If you are looking for Jobs in Kapurthala Army Public School then this article is going to be very helpful for you. Name of Department: Army Public School, Kapurthala. Last Date: 20 February 2019. TGT (English & Science): Post-graduate/ Graduation with B.Ed. in the relevant subject with minimum 50% marks in both. TGT (Computer): M. Tech in the Computer Science/ MCA or M.Sc. in Computer Science or B. Tech in Computer Science/ B.Sc. in Computer Science with 01-years of Post-graduate Diploma in Computer Science. TGT (Physical & Health Education): Graduation in Physical Education or B.P.Ed/ Bachelor of Sports/ D.P.Ed. PRT All Subjects: Post-graduate/ Graduation with B.Ed. in the relevant subject with minimum 50% marks in both. PRT (Art & Craft): Post-graduate/ GraduationMFA/ BFA in the relevant subject with minimum 50% marks in both. Head Clerk: ESM Clerk category (JCO) with 05-years of office experience in the Office Management, Accounts Handling as Head Clerk with proficiency in staff duties. The candidate should be a graduate in the case of a civilian. Science Lab Attendant: 10+2 with Science & Computer Literate. Note: Preference will be given to the CSB & CTET/ TET qualified candidates. The minimum age limit is 40 years and the maximum age limit is 57 years. On the basis of interview. The interview will be held in the month of February / March 2019. You can send your application form along with all attested certificates to the APS, Kapurthala by hand or by registered post along with the Demand Draft of the application fees.